Nourish your skin with Chamomile and Citrus hand and body lotion. 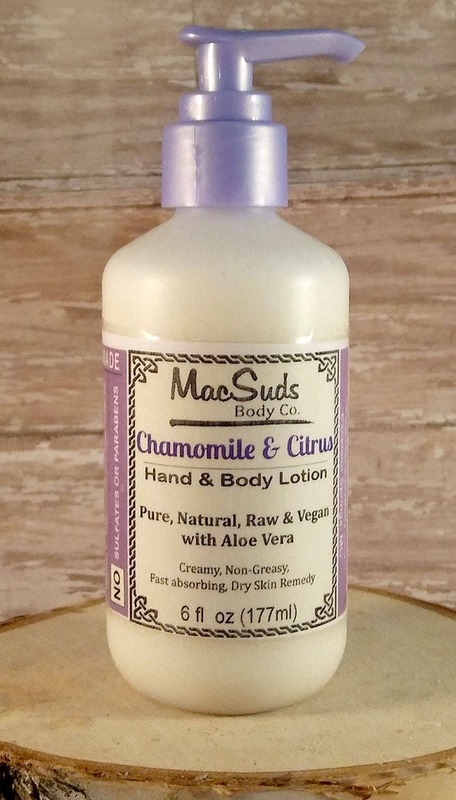 This lotion is lightly scented with orange and lime pure essential oils. My lotions are non-greasy and quickly absorb into your skin leaving you feel soft and supple. My lotions are great for all skin types. Why Chamomile? Chamomile posses many powerful skin properties such as anti-inflammatory, anti-fungal, antibacterial, antiseptic, and contains essential oils and antioxidants. Additionally, is a hypoallergenic and helps to reduce skin irritants by neutralizing free radicals. **Rice Bran Oil for Skin, the Deeply Hydrating, Anti-Aging Ingredient. Also known as rice bran extract, rice bran oil is simply the oil extracted from the germ and inner husk of rice. It's similar to peanut oil, with high percentages of fatty acids—which, by the way, makes it a perfect skin moisturizer! I needed a new facial moisturizer after my other stuff wasn't taking care of my dry skin anymore. I'm happy to say this was a very good change for me. After just a few days use, I no longer have dry skin. The smell is pleasant. The lotion is light and airy. It doesn't clog my pores. Shipping was super fast. 10/10 would buy again.